In the first segment of this article, we identified various misconducts that believers are often guilty of at work and debunked the notion that they are the gateway to wealth and success. You can click on the title below to read that post. In this segment, we tackle the fact that others are doing the same. This is no excuse as a close look at God’s word will show us. We also examine how we can guard against misconduct at our workplaces. We should remember that the time of reckoning is coming and God shall judge us by His word, not by the standards of the world. So how can we guard against misconduct at our workplaces? He has set our authorities over us, even if they are less than honorable, and the way we honor them reflects how we honor God as our authority. In regards to our words, we can ask God, like Psalm 141:3 to “set a guard” over our mouths. We can look for the positive things and give thanks in all situations, setting our thoughts on things above not on the earth (Col. 3:2) to keep our mind and spirit positive and peaceful even in the most chaotic, negative and stressful work environments. We do not have to strive or worry about money or coming ahead because we can trust that God is watching out for us and will always meet all our needs (Phil. 4:19). It is a daily choice to live by His standard. It requires daily discipline and new habit-forming choices, often placing God’s scriptures before us to train our minds to live accordingly. It is certainly not the path of least resistance, but I will tell you from experience on both ends of the spectrum, it is the most rewarding, the most joy-filled, blessed and abundant life when you choose to work for God the way He has asked us to in our daily jobs. All scriptural quotations in this article were taken from the English Standard Version of the Bible. This is a message for the workplace that needs to be shared regularly. 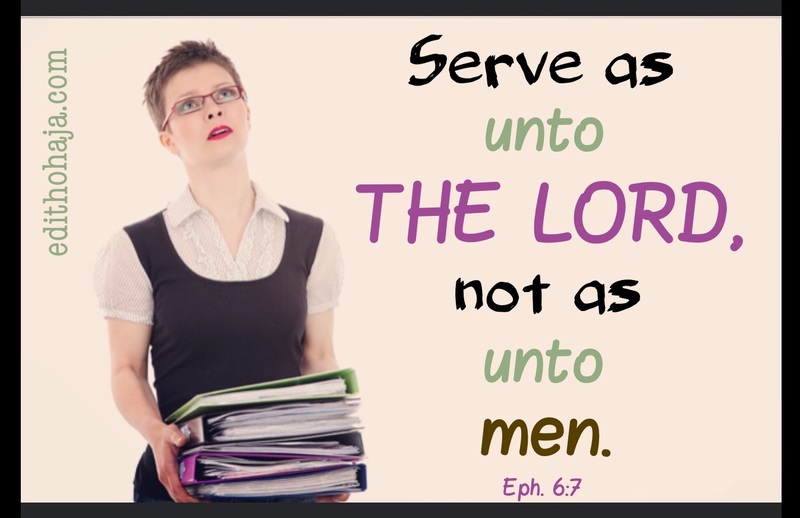 We are all accountable before God for our work-related actions and attitudes. I am afraid too many of us fail to realize this. You're right, Peggy! We're often unmindful of the fact that our work is first for God before our earthly employers. You are highly blessed in Jesus' name. Being of good conduct at any place not only our workplace is very important both to our success, Christian life and future. The world they say, is a small place and u certainly don't know who u will meet tomorrow, who will be ur helper and who will save you from distress. Let's always be of good conduct and influence people with our behavior and attitudes. Good advice. You are blessed, Vivian! A very interesting writeup, Coleman. Like Vivian said, our good conduct should not only reflect in our workplace; that is, some of us might not even be working but in our schools, empowerment centres, lessons, church and so on. We must learn to cultivate a good conduct and abide by them. Even St Peter spoke about respecting our elders and authorities that have been put over us because they are representatives of God. If we respect them we respect God, if we disrespect them then vice versa. Thank God for this write up. As Christians our ways of conduct at our work place, school etc. should reflect our Christ like nature . I pray that the Lord helps us to act in ways that not only preach the gospel but also represent Christ .